Successfully Added Navitron 5 Inch HD Touchscreen GPS Navigator with Metal Cover (4GB, 600MHz CPU, SiRF V) to your Shopping Cart. Not all GPS navigators are created equal. Some have power, with industry-leading hardware instantly guiding you every step of the way. Some have functionality, with useful video and music playback and direct Win CE access. Some have durability, usable anywhere and able to withstand all sorts of punishment. Then, some have it all - Say hello to the powerful Navitron 5 Inch HD GPS Navigator: Your guide to the world. With the Navitron GPS Navigator, you get the best. Featuring the super powerful ARM11 600MHz processor, 128MB of RAM, and a state-of-the-art SiRF V GPS chip, finding your way has never been easier or faster. That red light isn't going to wait for your GPS navigator to pick up your location and with the Navitron it won't have to because you're ahead of the game. Spoken voice directions, automatic route re-calculation, 2D or 3D mapping - the best is here, so why settle for less? Navitron is the GPS navigator that gives you everything. Feel like watching a few movies during a traffic jam? Listening to music while on the road? Even edit a few work documents that just need to be handed in? With the Navitron, it's all possible and with direct WIN CE 6.0 access, you can plug in a few edits to your Word, Excel, and PPT files at any time! Work or play, it's up to you. New and industry-defining mechanics start here. Able to rotate any which way, the Navitron GPS navigator's unique hard metal cover protects it against stratches, drops, bumps, and any other forms of destruction. What's more, the ultra durable cover turns into a handy stand with just a couple of twists and turns! Put it in your pocket, leave it on the windshield of your car, or just carry it around in your bag - the Navitron is sleek enough to fit anywhere, strong enough to do anything. Remember, you saw it here first. When you want it all, the Navitron HD GPS Navigator has no rival. Available in our warehouse now, order today and get it tomorrow. Brought to you by Chinavasion, the leader in wholesale electronics and GPS gadgets. Videos, pictures, music, PDF, Word, Excel, PPT, everything! Compatible with today's most popular GPS software such as TomTom, Route 66, iGo, etc. 800 x 480 screen resolution for movies that come out clearer, crisper, and brighter! You don't have to pay to use GPS. The satellites which transmit GPS coordinates are maintained by the US government. You just need a GPS receiver to take advantage of the data. 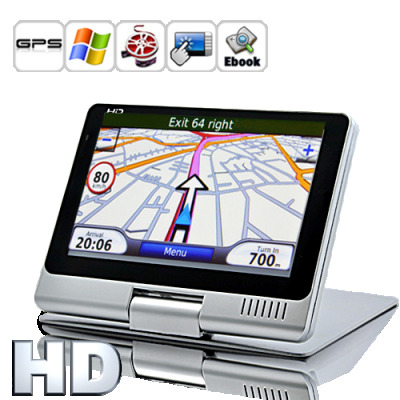 5 Inch HD Touch Screen GPS Navigator (Direct WIN CE Access) contains a top of the line GPS receiver. Copy the software and maps onto a microSD card. Insert it into the microSD card slot. From the main menu go to SETTINGS. Then select NAVI PATH and browse your microSD card. Look for a file that looks like this: nameofGPSsoftwaremaker.exe where the first part of the file before the dot is the name of the software maker, and the part after the dot signifies that it is an executable file. Received the package within 3 days. I was suprised that it had iGo 8.3 pre-installed and also in Dutch language. Compliments to you Chinavasion, for this excellent and very fast service. This is one of the best Chinese GPS I've ever seen. Huge screen, great vivid colors, bright back light. CPU is not Mediatek but even better, it's SOC SiRF 5 ... 600MHz + 298MHz DSP. Works great, it's really fast and doesn't drain battery in 1 hour. There is 128MB RAM ... After booting there is 91MB left. NAND Flash is 4GB and 3,8GB is available for user. Comes with preinstalled iGo 8.3 ... But i changed it to iGo Primo 1.2 and it works like a charm ... If anyone need help with sys.txt contact me on Twitter (My nick is SharkNX). Really best buy ... This is the best PND I've ever seen.